The Liverpool tradition of May Day parades began in the 1850s when drivers of working horses and their families took to the streets in holiday spirit. 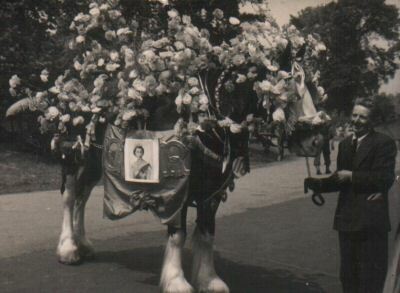 By the 1880s the Society for the Prevention of Cruelty to Animals and various promoters of heavy horse breeds had turned the parades into not only a free show for Liverpudlians, but also a chance to reward the owners of well-kept, healthy horses and encourage higher standards both of equine welfare and breeding. Later parades flourished in many other British cities, although all but the London shows faltered and faded away after 1939. The Liverpool May Horse Parade was revived in 1985, but seems, apart from one brief flourish at the Millennium, to have fallen once more by the wayside. In its halcyon days it must have been a wonderful sight. The horses were decked out in ribbons, braids and piles of flowers, as you can see in this brief, blurry piece of footage. The picture below shows Thomas Stopforth with one of his horses in Coronation year, and was lent by his granddaughter Julie Brown to the excellent Liverpool Retired Carters’ Association Archive here. The carters’ archive is a superb resource which also documents the campaign for a lasting memorial to both the horses and the men who kept the city going not only in the nineteenth and early twentieth century, but also through the bombings and devastation of World War Two. “Waiting”, a statue of a draft horse was unveiled on Albert Dock on May 1st 2010 on the anniversary of the old May Horse Parade. Quoted in The Horse Through Fifty Centuries of Civilisation by Anthony Dent. Thank you to Slaminsky for sending me this sign which she spotted in the window of Le Grenier. 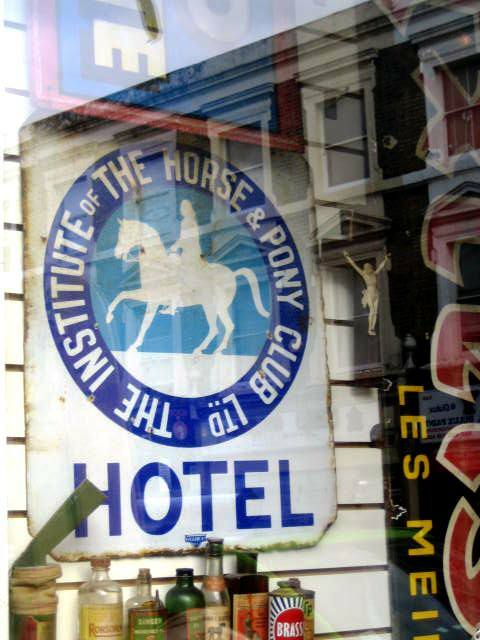 The Institute of the Horse was the original name of the British Horse Society, from which the Pony Club developed as an off-shoot. I suspect that this was rather like a Les Routiers recommendation – should you be travelling across the countryside on horseback, there were good stables and fodder here. If only we still lived in this world!